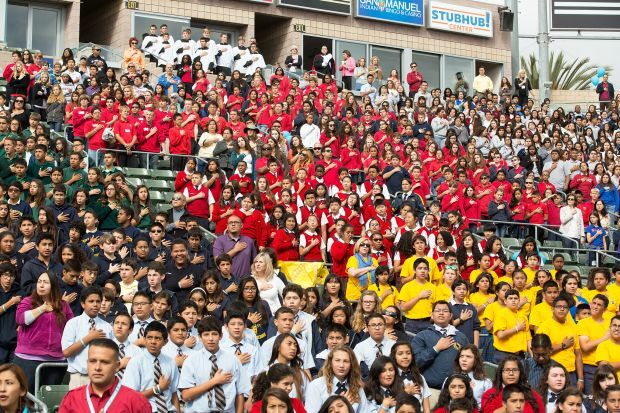 CARSON, Calif. (CNS) — Walking around the stage at the StubHub Center’s tennis stadium in Carson Oct. 9, Mexican singer, actor and keynote speaker Eduardo Verastegui addressed more than 6,000 Catholic school junior high and high school students gathered for the “Christian Service 4LIFE” rally. After taking voice lessons to improve his English pronunciation from a Catholic coach, he resolved to change his destructive lifestyle. He went to Mass daily, read the Bible, said the rosary, went to confession and, most of all, simply prayed. And he turned down juicy — but demeaning — roles in the Mexican soap operas for a year. Verastegui, now 39, joined with director Alejandro Gomez Monteverde and another partner to form Metanoia Films, now based in Beverly Hills. “Metanoia,” a Greek word, means a change in one’s way of life resulting from repentance or spiritual conversion. They were determined to make movies with a positive image of Latinos, instead of them always being portrayed as bandits, drug dealers, traffickers and womanizers. Their first effort was the big hit “Bella,” the award-winning film story of how an unborn child helps two people fall in love. In researching his starring role for the movie, Verastegui had an experience “that changed my life forever,” he said. “After that I said, ‘God, please use me as an instrument. I want to end this horrible crime in the world, and I’m going to do it through the media. Please help me and guide me,'” he recalled. After “Bella” was released to critical and popular acclaim, the film’s star and its director opened a pro-life crisis pregnancy clinic, Manto de Guadalupe, for poor Latina women near Lafayette Park in Los Angeles. Christian Service 4LIFE, presented by Lifesocal and the Los Angeles Archdiocese’s Office of Life, Justice and Peace. It was one of many events planned around the country for Respect Life Month, observed each October by the U.S. Catholic Church. They played life-awareness games. And they watched videos not only about abortion, but other much less publicized life issues such as respecting the elderly, eliminating poverty, caring for the sick, and helping the disabled and disadvantaged. The morning opened with a combination pep rally and teaching moment, featuring talks by professional model Brittney Sharaun, founder of the Skid Row homeless ministry “Burgers & Bibles”; the Rev. Walter Hoye II, who started Issues4Life and the California Civil Rights Foundation; Maria Cahill, Miss Delaware in 2011; and Father Bill Miscamble, a teacher, scholar and author at the University of Notre Dame. “So today as we are here in the presence of Jesus in the Blessed Sacrament, let us offer our prayers that we can listen to God and say ‘yes’ to him, and become the new missionaries of the 21st century,” the archbishop said during his brief remarks. “We need to defend the innocent — from conception to life and to natural death. Father Miscamble said that U.S. culture fosters a “blanket denial” over what is really happening to the weakest and most defenseless in the nation today. But the Holy Cross priest said he knew his youthful audience understands the truth. Nathaniel Rivera, a seventh-grader at St. Marianne School in Pico Rivera, said he could see himself being part of the next generation of pro-life missionaries Archbishop Gomez called for. Another seventh-grader from St. Marianne was charged up, too. Dellinger is a staff writer at The Tidings, newspaper of the Los Angeles Archdiocese.